SAN FRANCISCO — A boater with a 15-foot Boston Whaler powerboat made headlines when he announced he had “rescued” the America’s Cup World Series catamaran owned by France’s Energy Team Sept. 30, after the boat drifted off its mooring on San Francisco Bay. At the time, the team thanked boater Todd Tholke when he returned the boat to Treasure Isle Marina, and they offered him a boat ride on the 45-foot cat. However, on Oct. 5, Tholke surprised the team by having his attorney file a maritime salvage claim and presenting a warrant from U.S. District Court to “arrest” the boat and take it into custody after weekend America’s Cup World Series racing was over. Tholke’s attorney, John Edgcomb, told the San Francisco Chronicle that his client was entitled to a “liberal salvage award” in excess of $200,000, but it would be up to a court to work out the specifics. According to the court filing’s account of the rescue effort, Tholke’s boat “took on water, its motor cut out intermittently and smoked from overheating, and was nearly capsized on repeated occasions.” The claim also cites “the strength of the wind and currents, and the nighttime conditions” as adding to the risk involved in Tholke’s rescue of the catamaran from drifting into the rocks. 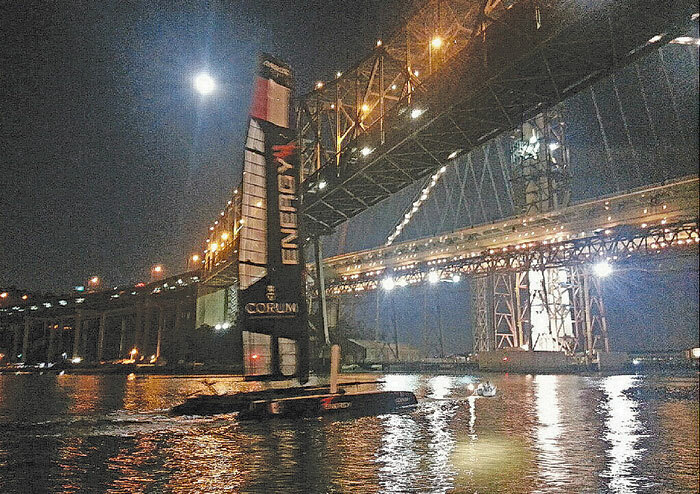 However, Energy Team’s attorney, Noah Hagey, told Reagan Haynes of Soundings Trade Only that Coast Guard records show San Francisco Bay was calm that night, with winds between 0 and 2 knots. A Coast Guard photo obtained by Haynes, showing Tholke’s Boston Whaler towing the Energy Team catamaran, seems to support the claim that the tow took place in calm waters.